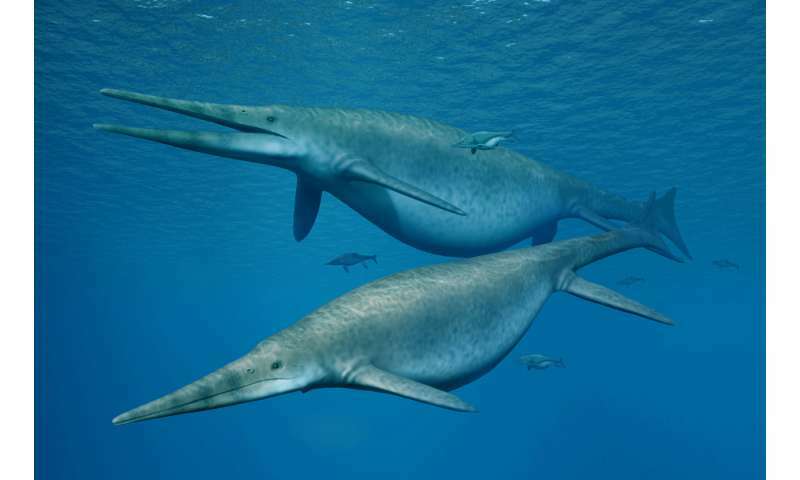 A 205-million-year-old jaw bone belonging to an ancient porpoise-like reptile known as an ichthyosaur was likely one of the largest ever known on Earth, researchers in Britain said Monday. The bone fragments of the long-extinct fish predator were spotted on the beach at Lilstock, Somerset in May 2016, and together they measure about three feet long (96 centimeters), said the report in the journal PLOS One. 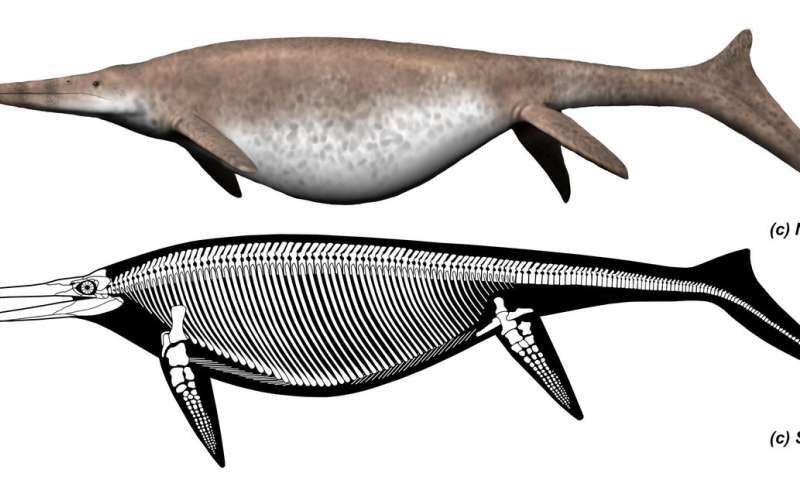 After comparing them to another set of bones in Canada scientists believe they came from an ichthyosaur that was close to 26 meters long, almost the size of a blue whale. The bones in Canada belonged to what used to be the largest ichthyosaur known, the 21-meter-long shastasaurid Shonisaurus sikanniensis. "As the specimen is represented only by a large piece of jaw, it is difficult to provide a size estimate," said Dean Lomax, an ichthyosaur expert at the University of Manchester. "But by using a simple scaling factor and comparing the same bone in S. sikanniensis, the Lilstock specimen is about 25 percent larger." Fossil remains of ichthyosaurs suggest they lived throughout the Mesozoic Era, 251 million years ago until 65 million years ago, but they were not considered dinosaurs. Rather, they were aquatic reptiles that were cousins of lizards and snakes, reliant on air to breathe but unequipped with gills. The 2016 jawbone discovery also led scientists to re-examine 208-million-year-old bones uncovered in 1850 in Aust Cliff, Gloucestershire. They had been identified as the limb fragments of several different dinosaurs and reptiles. 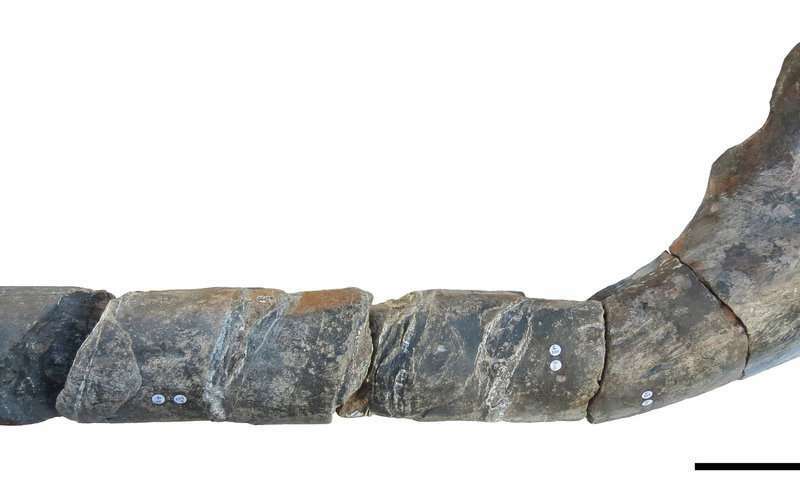 But now, researchers believe the bones were actually from another ichthyosaur, one that might even have been larger than the Lilstock specimen. "Size estimates suggest that the Lilstock and Aust ichthyosaurs are the largest ichthyosaurs presently known," said the study. However, paleontologists won't know for sure until more fossil remains are uncovered that would shed light on what a complete giant early Mesozoic ichthyosaur from Britain actually looked like.